Dr. Gamewell began his path toward becoming a missionary when, after recuperating from a severe illness, he decided that his current studies were not the calling God had intended for him. 1 Gamewell matriculated to Dickinson College in 1877, which was, at that time, affiliated with the Methodist church. Under the advice of several clergymen and professors, and following some of his other family members, Gamewell made his decision to become a missionary, subsequently putting his fate in the hands of the Foreign Missionary Society of the Methodist Church. In October, 1881, Rev. Frank D. Gamewell arrived in Beijing, China. He soon met his future wife, Mary Porter, also a missionary, and in December they were married. Fortunately, Mrs. Gamewell recorded her life as an agent of the church in her diaries, which were later compiled into a volume entitled Mary Porter Gamewell and her story of the siege in Peking. This work is an excellent reference to turn-of-the-century Missionary life in China. 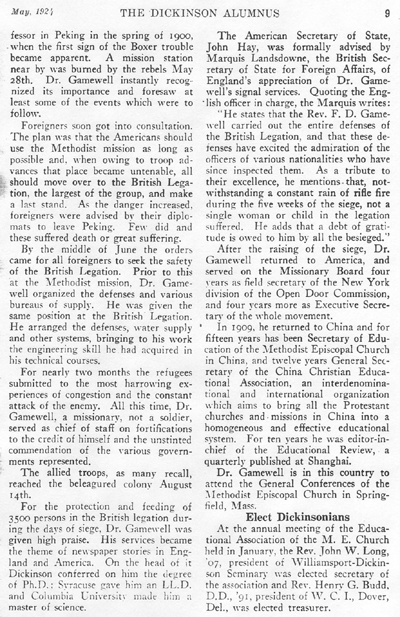 In 1884, the Gamewells started their first collective missionary work in Chongqing. Gamewell searched for a suitable site to expand the mission for two years. Finally, in March of 1886, they began expanding the mission by building a hospital, a girls' school, and several mission homes. Mary was a missionary in the traditional sense of the word. She was most likely to be seen at the local Sunday school spreading the gospel and teaching young Chinese girls how to read.2 Frank, on the other hand, was appointed superintendent of the West China Mission and, in this capacity, he supervised the construction of most of the buildings. His portfolio included the erection of the largest Protestant ecclesiastical structure in China. It held 1500 people and was by far the most auspicious structure of the Methodist compound. The difference between Gamewell and Brewer's ability to understand their neighbors presents an important generational distinction. Brewer's understanding of customs, and the language, gave him a significant edge in understanding the political situation. Gamewell perhaps thought the West could force China to change, and to modernize. Brewer realized that only China could truly change China, so he tried only to educate those he came into contact with, and in doing so tried to nudge China in the right direction. As was typical of other missionaries, after ten years of missionary work, the Gamewells returned to America. During this break from missionary life, Frank studied Physics at Columbia and received his doctorate there. When the Gamewells returned to China, Frank began his career as a professor at Peking University. Click on the article to the right to see the Dickinson Alumnus magazine's report on Gamewell's work during the Boxer Rebellion. The Boxer Uprising took its toll upon the city, as well as on the Gamewells. Mary's sustained bout with illness had brought her to the breaking point. The Boxers invaded the city immediately before Mrs. Gamewell planned to leave for America to receive medical treatment. On August 22, 1900, she left China, never to return. 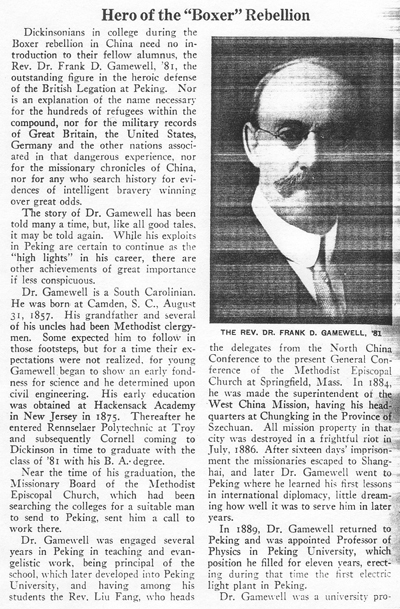 Dr. Gamewell was appointed by the Missionary Board of the Methodist Episcopal Church as Field Secretary of the Open Door Commission. Unfortunately, the events following his appointment remain unknown. In 1906, Mary died, leaving behind a tale of woe about a journey to a foreign land and its native customs. For her, the culture proved to be too entrenched in pagan rituals to readily accept the Christian ideals that men and women from places like Dickinson College sought to bestow. 1. Gamewell, Mary Porter. Mary Porter Gamewell and her story of the siege in Peking. 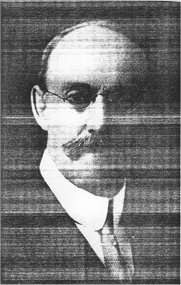 Ed A.H. Tuttle. New York: Eaton & Mains; Cincinnati: Jennings & Graham, 1907. pg 100. 2. Gamewell, Mary Porter. Mary Porter Gamewell and her story of the siege in Peking. Ed A.H. Tuttle. New York: Eaton & Mains; Cincinnati: Jennings & Graham, 1907. pg 105. 3. Gamewell, Mary Porter. Mary Porter Gamewell and her story of the siege in Peking. Ed A.H. Tuttle. New York: Eaton & Mains; Cincinnati: Jennings & Graham, 1907. pg 129. 4. Gamewell, Mary Porter. Mary Porter Gamewell and her story of the siege in Peking. Ed A.H. Tuttle. New York: Eaton & Mains; Cincinnati: Jennings & Graham, 1907. pg 284. 5. Gamewell, Mary Porter. Mary Porter Gamewell and her story of the siege in Peking. Ed A.H. Tuttle. New York: Eaton & Mains; Cincinnati: Jennings & Graham, 1907. pg 190. Thanks to Robert Reeves and Drew Kaiden for their work on the Engaging the World-Dickinson in China website. Some information here is borrowed from that website.